I got the idea of making banana fritters when I ate beignets at Founding Farmers in Washington, D.C. I added the ripe banana just to give it a hint of banana flavor. I served my fritters sprinkled with confectioners’ sugar, but if you are adventurous you could serve it with chocolate or caramel sauce. Beat eggs, oil, milk, vanilla and sugar. Sift flour, baking powder and salt. Add to egg mixture and beat until the batter is smooth. Stir in the mashed banana. Heat oil for deep frying in a wok over medium-high heat until shimmering but not smoking. Drop tablespoonfuls of the batter gently into the oil. Fry until both sides are lightly golden brown. 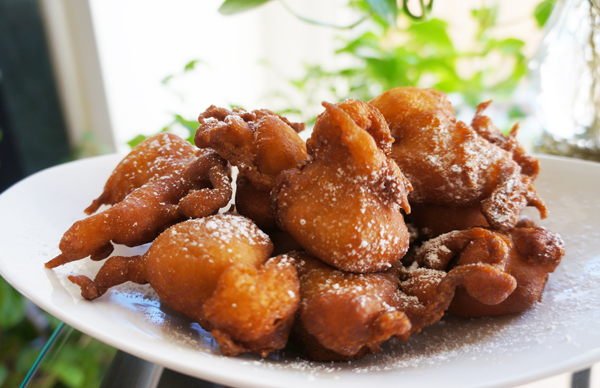 Drain on paper towels and sprinkle with confectioners’ sugar while the fritters are still warm. Serve immediately. There’s nothing like waking up to pancakes on a Sunday. I wish I could have them more than once a week. I must admit that, for many years, my pancakes were made from a box of Bisquick. This morning, I made some blueberry pancakes from scratch, thanks to the crew from America’s Test Kitchen. And they are simply amazing! My family knows I love cookbooks so when they visit me they often bring me books. My nephew, Bobby, and his wife, Anna, visited recently from New York and they brought me, The Complete America’s Test Kitchen TV Show Cookbook – 2001-2013. Thanks, kids, I love the book. The blueberry pancake recipe that I share with you today is adapted from this book. 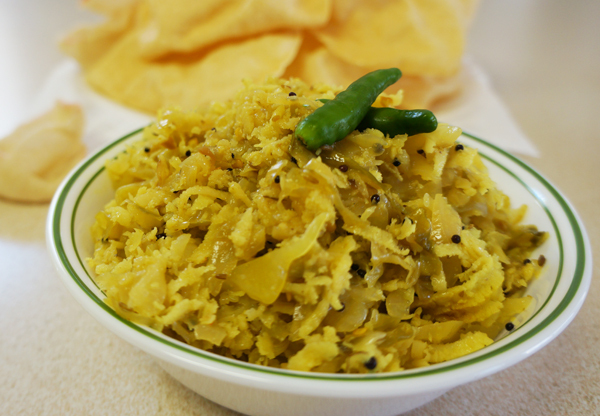 So, get in the kitchen and give this recipe a try. I promise, you will not go back to making pancakes from a box! Place the blueberries in a mesh strainer and wash them gently by running cold water over them. Dry the blueberries on a paper towel lined plate. In a medium bowl whisk the flour, sugar, baking powder, baking soda, and salt. Whisk the egg, melted and cooled butter, and buttermilk until combined. Make a small well in the center of the dry flour mixture; pour the milk mixture and whisk very gently until just combined. Don’t over-mix. Heat a large nonstick pan over medium heat; add 1 teaspoon of oil and turn the pan to coat the entire surface. 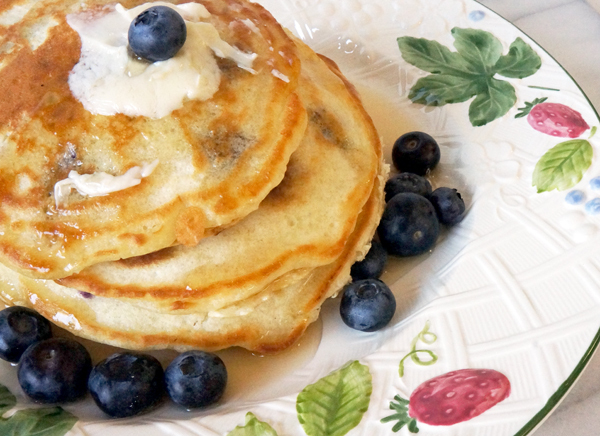 Pour ¼ cup of the batter onto three spots on the pan; sprinkle 1 tablespoon of the blueberries over each pancake. Cook until large bubbles appear on the surface of the pancake. About two minutes. Turn the pancake’s and cook until golden brown on the other side. Make the rest of the pancakes in the same manner. These pancakes taste best topped with butter and dusted with confectioners’ sugar. Yummy! A bowl of hot soup is a welcome comfort on cold winter evenings. I make soup for dinner quite often because it is easy to make, filling, and light enough for an evening meal. 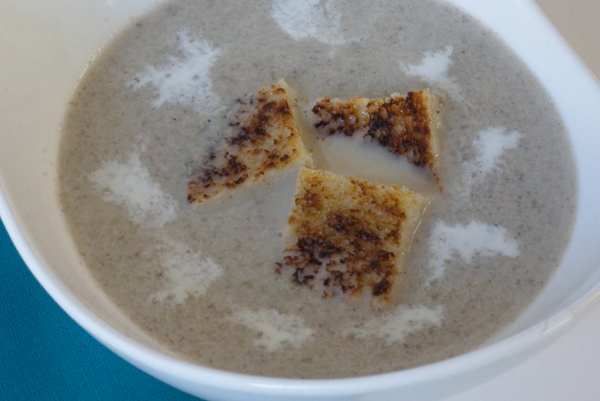 The mushroom soup recipe that I am sharing with you today is a basic recipe which can be changed easily with whatever vegetables you have on hand. For example, if you don’t have enough mushrooms, you could add a potato, two carrots, two sticks of celery and make a vegetable soup. Soup and toasted cheese sandwiches are made for each other. Try this recipe and let me know how it turns out. Stay warm! Wipe the mushroom clean and slice into ¼ in thick pieces. You can use the stems as well. Melt butter in a large pot over medium low heat. Add the shallots and sauté until transparent. It will take about 4 minutes. Add the garlic and nutmeg and cook until fragrant. Add the mushrooms and stir well so that the pieces are coated with butter. You can turn the heat up to medium high at this point. Stir once in a while until the mushrooms release their liquid. Reduce the heat to medium low and cover the pot and cook until all the water evaporates. Add chicken stock or vegetable stock and the hot water. Cover and bring to a simmer, then reduce the heat to low and simmer until the mushroom are fully cooked and tender. It will take about 20 minutes. Let the soup cool. Puree the soup in a blender until smooth. Put the puree back into the large pot and add the cream. Bring to simmer over low heat. Season with salt and pepper. Garnish with croutons and little blobs of cream.